The VPAG is delighted to announce that we have another new Patron; Eric Hester. We are very honoured that he has agreed to join us and we extend to him our warmest greetings. A short biography of all our Patrons can be viewed by clicking on the Patrons tab above. The Rt. Hon. Michael Gove MP, Secretary of State for Education, heaped great praise upon Cardinal Vaughan Memorial School, its staff and its parents on 17th October during Education Questions in the House of Commons. Please click on the link below to hear what he had to say in answer to questions from Edward Leigh MP, a Patron of the Vaughan Parents' Action Group. Following the comments made by the Rt. Hon. Michael Gove MP, Secretary of State for Education, in the House of Commons during Education Questions on 17th October 2011 we issued the following press release. We welcome the Secretary of State's robust recognition of the importance of parental influence in the governance of schools in general and the Cardinal Vaughan Memorial School in particular, and we are very grateful indeed to him for his warm words of endorsement for our wonderful school. Mr Eynaud, our Acting Headmaster, has steered the school skilfully and successfully through two very turbulent years and the debt we owe him is simply incalculable. We warmly welcome the appointment of Paul Stubbings as the new Headmaster and we look forward to supporting him in whatever way we can to ensure that the Vaughan's precious inheritance is preserved for future generations. The Vaughan Parents’ Action Group warmly welcomes the appointment of Mr Paul Stubbings to the substantive position of Headmaster of The Cardinal Vaughan Memorial School. Mr Stubbings commands widespread respect at the Vaughan having served the School with distinction for twenty-two years, most recently as Deputy Headmaster. As Mr Stubbings takes up his post in this high achieving Catholic school, we offer him our support and prayers. Parents will work with the new Headmaster to ensure the School remains a beacon of the Catholic Faith, and to sustain its record of outstanding academic, musical and sporting achievements. The Vaughan Parents’ Action Group is deeply grateful to the elected Parent Governors who have valiantly withstood huge pressures over the last year in their fight for parents’ voices to be properly represented on the Governing Body. The precious inheritance of the Vaughan lives on in no small part due to the devotion and expertise of Mr Charles Eynaud. As Acting Headmaster, Mr Eynaud has led the School with dignity and skill through two of its most turbulent years. The debt of gratitude we all owe him is simply incalculable. We pray that this appointment "agreed unanimously by the Governing Body" heralds a new era of openness and transparency. We expect the Governors to give our new Headmaster the total support the post requires. We hope that the Foundation Governors, in particular, will work co-operatively and reasonably with all the Governors so that the Vaughan’s proud traditions of love and service may benefit generations of Catholic children to come. The Government has launched a consultation on the changes it proposes to the School Governance (Constitution) (England) Regulations 2007 to close the legal loophole which the Diocese relied upon when it made its appointments to the school's governing body just over a year ago which so enraged parents and which resulted in no Foundation Governors being parents of children currently attending the school. The aim of these draft regulations is to provide that when appointing Foundation Governors who are eligible for election or appointment as parent governors, appointing bodies must go through a staged process; they must first consider appointing parents of current pupils at the school and only if this is not possible will they be able to consider appointing parents of former pupils; and only if it is not possible to appoint parents of former pupils will they be able to consider appointing parents of children under or of compulsory school age who attend other schools. Once made law, the effect of these proposed changes will be to reverse the effect of the Diocese's victory by a split decision in the Court of Appeal and to close the legal loophole upon which the Diocese based their case. The Government's consultation documents can be found here. We are deeply indebted to Lord Lexden and the other members of the Vaughan Parents' Action Group who brought this to the Government's attention. We would also like to thank Lord Hill, Parliamentary Under Secretary of State for Schools, for all his work in bringing forward this proposed change in the law. The evening of Wednesday, September 15th saw parents, pupils past and present and supporters of the Vaughan came together as a family to pray for the future of the school. As dusk fell over Westminster piazza the crowd gathered, candles were lit, the rosary was reverently recited and hymns were sung. It was moving to be part of this prayerful and peaceful vigil and witness the community's love for this special school. Why did we hold this vigil? We wanted to pray for a just, fair and transparent appointment process for the new Head, and to pray for an appointment that will command the support of all sections of the Governing Body. It is only the third time in 35 years that the school is looking to appoint a Head and the Governors have announced that they hope to have completed this process by the mid-October. It is the sole responsibility of the Governors to appoint the Head. But current parents are still not properly represented on the Governing Body despite the welcome recent appointment by the Diocese of a current parent as a Foundation Governor. This under representation is a real cause for concern when the Governing Body are about to choose our new Head because if a consensus cannot be achieved a new headmaster could be appointed without the support of staff, or parent or local authority governors. The Head could be appointed with the inbuilt majority of the Foundation Governors as they number 11 out of 20 governors. How could this augur well for the future of the school? It is for this reason that our elected Parent Governors have requested an extra-ordinary meeting of the Governors. They will seek to achieve agreement for a consensus appointment. It is vital for the future of the school that they are successful in this endeavour. Prayers are needed as never before. Someone once remarked that Cardinal Vaughan Memorial School is not our school. Indeed it is not our school and current parents are the first to recognise this. Cardinal Vaughan Memorial School is in trust to us and as our children learn in its classrooms and grow in their faith, we have a duty to protect this very precious inheritance. The school must survive for future generations to come so that families who want a Catholic education for their children may be assured it is still available at CVMS. We are delighted to announce that the Government has intervened to help us in our campaign to appoint current parents in the school as Foundation Governors. We believe that the Catholic Diocese of Westminster has, in effect, gerrymandered the Governing Body by refusing to appoint parents of children in the school as Foundation Governors and filling it with placemen instead. We have always maintained this is against the law. 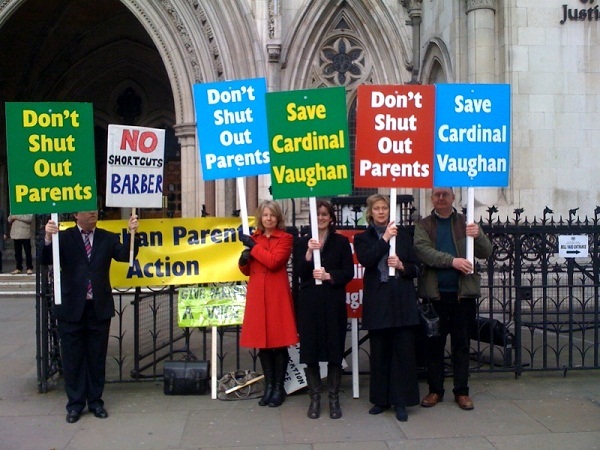 One judge in the Court of Appeal strongly upheld our view, but the other two said the Diocese's interpretation that "parent foundation governors" in the regulations did not have to be Cardinal Vaughan parents, was lawful. Following this split decision, we asked for the government to intervene. vigilance is needed in protecting choice and rights which parents have long enjoyed. I have recently drawn one specific cause of concern to the attention of my noble friend the Minister in my role as a patron of a campaign organised by parents of the Cardinal Vaughan Memorial School in London. Parents with children at the school are being denied their proper role on its governing body by the Roman Catholic diocesan authorities. This is a case which has implications for all 4,000 voluntary-aided schools in England. The law needs to be clarified. I hope that, either in Committee or through some other means, the Government will be able to set out their view. Now the education minister, Lord Hill, in a letter to Lord Lexden, says he intends to amend the school governance regulations The effect of this amendment will be to remove all doubt that the requirement on appointing bodies to include 'parents' as Foundation Governors means parents of children currently in the school, except where none is available to serve. A consultation period on the implementation of the amendment will begin at the start of the Autumn term. The Diocese has gone to extraordinary lengths to keep Vaughan parents off the Governing Body and so shut them out from crucial decisions on the future of this outstanding school. The Archbishop and his advisers have shamelessly exploited an apparent loophole in the law. We don't understand why the Diocese has been at such pains to exclude us, but we believe that it has in mind changes to Cardinal Vaughan which no parent there would want. We welcome Lord Hill's intervention as a breakthrough for parents’ rights. We would like to thank our patrons for their invaluable support and encouragement. But our work is not over. This development represents a very important step for our campaign. But the law will not come into effect straight away. For this reason we ask you now to appeal respectfully to Archbishop Nichols to appoint two current parent foundation governors immediately - before the appointment of a new Head in the Autumn. It is essential that everyone has confidence that the Governing Body is correctly constituted before it undertakes this most important task. Archbishop Nichols has the power to do this. He is clearly, in our view, morally obliged to do it. Please help us to make sure that he does it. The Archbishop can be contacted by email at archbishop@rcdow.org.uk or by post at Archbishop’s House, Ambrosden Avenue, London SW1P 1QJ. We would be interested to see copies of your letter and any replies you receive. We will be posting more important news, in the next few days. On June 2nd we wrote a letter to parents and friends which can be found here. This prompted Mr O'Donnell, the Chairman of the Governing Body, to write a letter to the Catholic Herald which is reproduced in the entry on Damian Thompson's Telegraph blog which can be found here. The VPAG is delighted to announce that we have another new Patron; Sir Swinton Thomas QC. Sir Swinton Thomas is a former judge of the Court of Appeal. He was educated at Ampleforth College and at Lincoln College, Oxford, after serving with the Cameronians (Scottish Rifles) from 1950-51. He served as a Recorder of the Crown Court from 1975-85, a High Court Judge from 1985-94 and a Lord Justice of Appeal from 1994-2000. He was Vice-Chairman of the Parole Board in 1984. He was knighted in 1985 and became a Privy Counsellor in 1992. After retiring from the bench he served as Interception of Communications Commissioner from 2000-06. He was Vice-Chairman of the Archbishop of Westminster's Working Party on Child Protection in 2000-01. He is a Knight Commander of the Order of St Gregory the Great and Chariman of the Association of Papal Orders in Great Britain. The VPAG is delighted to announce that we have another new Patron; Sir Paul Kennedy QC. Sir Paul Kennedy is a former judge of the Court of Appeal and currently serves as Interception of Communications Commissioner. He was educated at Ampleforth College and Gonville & Caius College, Cambridge, of which he is an Honorary Fellow. He also has an Honorary Doctorate from Sheffield University. During his 40 year career as a judge he served as a Recorder on the North Eastern Circuit from 1971-83, a High Court Judge of the Queen's Bench Division from 1983-92, a Lord Justice of Appeal from 1992-2005 and remains a member of the Court of Appeal of Gibraltar. He was knighted in 1983 and became a Privy Counsellor in 1992. He was appointed Interception of Communications Commissioner by the Prime Minister in 2006, and in April 2009 was reappointed for a further three year term. In late 2009, following recommendations by the auditor Sir Thomas Legg that a number of MPs be required to repay certain expenses claimed, Sir Paul was appointed by the House of Commons to decide on appeals by MPs against the rulings. The Archbishop of Westminster has, sadly, not appointed a current parent as a Foundation Governor to replace Fr. Michael Johnston who has, it would appear, unexpectedly resigned. We have issued the following press release available here. The Parent Governors are seeking permission to appeal from the Supreme Court. The Vaughan Parents' Action Group fully support the elected Parent Governors' decision and will continue to support them in their fight to return good governance to the school and to ensure proper representation for parents, not just in the Vaughan, but in all voluntary aided schools. The Parent Governors explain their decision to seek permission to appeal from the Supreme Court in the letter which can be viewed here. The VPAG are delighted that the VPA has asked Mr O'Donnell, the Chairman of the Governing Body, for a meeting with parents. Mr Anna Brown, the VPAG Chairman, writes here. If, like us, you would like the voice of parents to be heard please help us. We want you to help with our petition to Archbishop Vincent Nichols. Please download and print a copy of our petition form here and get it signed by as many relatives, friends and neighbours as possible. Please take it to your local primary school, to other parents at Sunday Mass and to colleagues at work. Explain the issues involved and collect as many signatures as possible. Please support parents as the primary educators of their children and add your names to the many hundreds who have already signed. Members of the Vaughan Parents' Action Group demonstrated their support for the Parent Governors outside the Royal Courts of Justice in the Strand as the Court of Appeal heard the Appeal and some are pictured above. Whilst those inside the courtroom heard respectful submissions from Counsel and legal arguments about statutes, regulations and appointments, our members outside enjoyed tremendous support from the public and aroused a great deal of interest. We ran out of leaflets as many passers-by asked for details of the issues we were supporting. Not all moments were serious though - we had to explain to one passer-by who, upon reading our 'Save Cardinal Vaughan' banner, stopped to ask us, 'What has the Cardinal done? Are the beaks going to send him down?' that the banner referred to the School. We are also indebted to the London's black taxi drivers for all their support. One of their number who was passing our banners stopped and told us that he was a parent of a current pupil at the School. He wished us good luck and tooted his horn. However he managed to do it, he passed the message across the black taxis drivers of London and many also tooted their horns in support as they passed us in the Strand. The Schola Cantorum of Cardinal Vaughan Memorial School recently conducted a tour of Rome. I offer heartfelt greetings to all the English-speaking visitors present at today’s Angelus! In particular I greet the young singers from the Cardinal Vaughan Memorial School in London. The Cardinal’s motto, “Amare et Servire," is a beautiful expression of the Christian way of life. We are all called to love unconditionally, as today’s Gospel reminds us, and to place ourselves generously at the service of our neighbour. Upon everyone here today, and upon your families and loved ones at home, I invoke God’s abundant blessings. The Holy Father's address to the Schola can be viewed below - please fast forward to 9 minutes and 50 seconds. We would like to thank the many hundreds of parents and friends of the Vaughan who attended our Candlelit Vigil on a cold evening. We sang hymns and prayed for the good estate of the School. It was a most prayerful and reverential occasion and one that will be remembered for a long time. We had to stand in the street outside the School on a cold night as we were not allowed use of the School Hall on the order of Mr O'Donnell, the Chairman of the Governing Body and Foundation Governor appointed by Bishop Stack and Archbishop Nichols. Although Bishop Stack, the Chairman of the Westminster Diocesan Education Service, found the time to record an interview with the BBC on the day and Archbishop Nichols found the time to issue a statement to the press on the day, it would appear neither had the time to instruct Mr O'Donnell to allow us the use of the School Hall on the day. Could there have been a more telling example of the bullying and deliberate marginalisation of parents by the Diocese than this? A short film of the Candlelit Vigil we held outside the School on February 2nd can be seen below. In the following letter to the Archbishop, Professor Gormally argues that there is no canonical or theological basis for the Archbishop's use of his authority to enforce the WDES education policy. Letter to the Archbishop from Prof. Gormally 18th June 2011. Lord Lexden put forward proposals to end the Vaughan dispute in an open letter to the Archbishop. Letter to the Archbishop from Lord Lexden 4th August 2011. The Vaughan dispute was covered in the 9th July edition of the Daily Telegraph. It can be accessed online here. A talk on Catholic education by Professor Booth. This is the text on an excellent talk on Catholic education delivered in June 2011 by Professor Booth, one of our Patrons. Catholic social teaching and education policy. Following the apparent apology from Mgr Curry which is reported in the Catholic press this weekend, we have written the following letter. Our letter can be seen here. This talk was first given to the Order of Malta on 25th January 2011 and repeated to parents on March 8th 2011. Sir Adrian was Chairman of Governors at CVMS for four years and is now the local authority representative on the Governing Body.